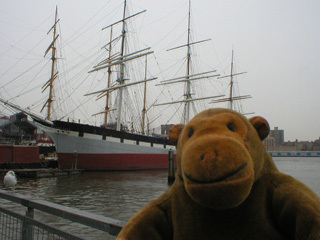 "This is the Street of Ships, apparently"
Because the South Street Seaport still insisted it was closed on Monday, Mr Monkey couldn't go aboard the ships, so he just looked at them from the pier. The big grey and red ship is the Waverley, built to take jute from eastern India to Bangladesh. It's the largest wrought iron sailing ship still afloat. Next to the Waverley was a tugboat, the W.O. Decker, and the Helen McAllister. 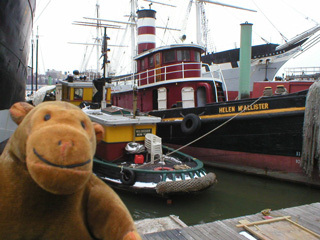 All Mr Monkey can find out about Helen McAllister is that she probably used to belong to the McAllister Towing, and that the Seaport Museum wants people to help restore her, which sounds suspiciously like hard work for a small monkey.